I haven't yet updated to the newest software, but I have noticed yellow splotching on nearly every scan I've done, although not this bad. I assumed it was largely from color casting, although I couldn't figure out why it is always a yellow cast. Matterport seems to be aware of the issue from reading their forum. But unless we can do a color balance or have the ability to remove color pollution (a daunting task for an entire house), I don't know how this could be entirely avoided. @Mikesobay when you say updated top newest software do you mean the workshop or is there a capture update? @3Dwalkmethru I believe an update for the camera, but I'm only guessing. I get the notice only when the camera is on and I turn on the iPad, which I've been dismissing. @Mikesobay have not seen this, but going to try it now ..
@3Dwalkmethru did you mean IOS update ot Matterport update? @3Dwalkmethru It was a camera update. It may be an older one as it came up each time I was ready to work and I would dismiss it. @Mikesobay thanks have not seen it so guess I'm running on current version. So i rescanned the problem unit. I changed all the bulbs to 40w as someone said to dim lights with dimmers to help. It did help somewhat but the areas that have no environmental light(bathrooms with no windows are still an issue. Matterport did reprocess the new scan but as i expected it was just desaturated. Some areas are better but bathrooms are still bad and in addition the collers are all muted. 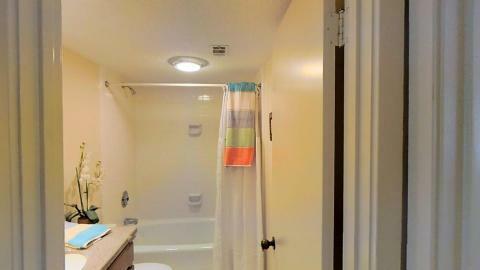 Here is the bathroom after reprocessing. Does anyone know if Matterport changed their process? I did this scan in April of this year, it had all the lights on and even has some yellow walls. I cringe to think what it would look like now to have it processed.. The problem is the lightning in general. In my opinion this could only be fixed by "daylight" (shot at another time) if natural sun lightning can be used (room must have a window) or by adding additional lightning (led with a filter) to the scene. You need about 3 ones and place them at your tripod. I agree Mori. I have one similar and All the tests I have done have worked well with it. In a small bathroom it does not give could coverage from floor to ceiling. Did a test today using a vertical LED strip light. Only had it facing into the bathroom and it did a good job. Unfortunately it is 110v so may be hard to hide cord in many instances. Was more to verify the process...now to refine it until Matterport releases the fix. I have been told they are close to a fix.